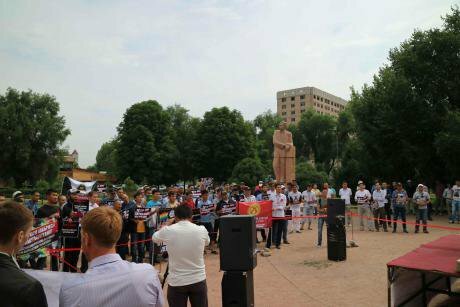 On the morning of 14 June, around 40 people rallied in Bishkek's Gorky Park in support of a bill banning 'gay propaganda' from the small Central Asian state. In the first public anti-LGBT protest since early 2014, the young, mostly male crowd stood almost motionless, listening to speeches, occasionally clapping and cheering. Three policemen watched from the shade of a tree. After 90 minutes, the crowd broke up and departed, leaving Gorky Park to its usual neglected state. Although small and seemingly innocuous, the rally points to the growing political and social forces, which threaten Kyrgyzstan's status as an island of democracy in a region of authoritarian and repressive regimes. A mixture of Kyrgyz, Russian and Muslim cultures and ethnicities made up the crowd. Men wore traditional Kyrgyz kolpok hats, taqiyah and baseball caps. Speeches were made in both Russian and Kyrgyz. The rally was advertised on Facebook by Nasaat Media, but the majority of speakers were members of the radical nationalist movement Kalys. Kalys style themselves as a social movement, with political aspirations and an organisational hierarchy. In June 2014, Kalys reported that they gathered 5,000 signatures in support of a 'foreign agents' bill. In Russia and elsewhere, this kind of legislation is used to discredit and impede the work of NGO organisations. However, it is unclear where the majority of Kalys' supporters were on Sunday morning. In a display of professionalism, members at the rally wore plastic lanyards around their necks and red ribbons adorned with the Kyrgyz flag. However, Kalys are responsible for a series of violent attacks on LGBT groups: last month, members stormed an LGBT event and posted videos on You Tube with titles 'Kalys crushes the gays' and 'Disperse the fags'. 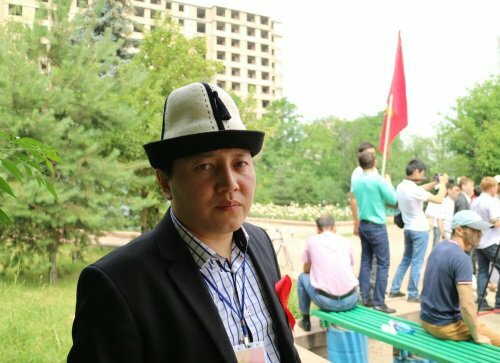 Zhenish Moldokmatov, leader of Kyrgyzstan's Kalys movement Whether you consider them thugs or political operatives, Kalys boasts what every public organisation needs: a charismatic, articulate leader. Despite reportedly being charged with hooliganism after attacking LGBT groups on International Day Against Homophobia, Zhenish Moldokmatov, the head of Kalys, gave speeches at the rally wearing a suit and a kolpok. In Russian and English, Moldokmatov calmly told me that they were meeting to express their support to parliament for two bills. The first bill would ban expressions of 'non-traditional' sexual relations, and the second, the 'foreign agents' bill, would require NGOs involved in 'political activities' to register as foreign agents. Both bills have passed a first reading in parliament. Another two successful readings in parliament and only President Atambayev's signature will be required before they become law. Although they appear different in intention, both bills mimic Russian legislation, signalling Kyrgyzstan's increasingly tight geopolitical bond to the region's political and economic powerhouse. Both bills also originate from the same desire to restrict what proponents view as corrosive foreign influence on Kyrgyz values, including homosexuality. When the event poster was made public two weeks ago, activists from local LGBT organisation Kyrgyz Indigo wrote to the Ministry of Internal Affairs, the Prosecutor's Office and the President's Office, arguing that the rally constituted incitement to hatred. Citing the title of the poster ('We are against gays and lesbians. Are you? '), and images of clenched fists and blood splattered over the word 'gay', Kygryz Indigo argued that the rally would violate the constitutional prohibition of hate speech. They also argued that the 'gay propaganda' law would violate Articles 16 and 20 of the Constitution, which protect freedom of expression and assembly. As yet, Kyrgyz Indigo has received no official response. Ruslan Kim, Director of Advocacy for Kyrgyz Indigo, told me that the decision to permit the rally appears to have been based on the constitutional right of prospective participants to publicly express their views – a constitutional right that Kalys are fighting to have removed from the LGBT community. This development is extremely concerning to NGOs operating within the country. They believe the bill will be used to restrict civil and human rights work. Kalys supporters rally in Kyrgyzstan's capital Bishkek in support of a bill against 'gay propaganda' Tolekan Ismailova, Chairperson of Bir Duino, the leading human rights organisation in Kyrgyzstan, told me last week that after years of being attacked by religious or nationalist groups, she believes that finally the Kyrgyz Parliament is targeting her organisation. Bir Duino's offices in the southern town of Osh were recently raided by security services and, pointing to a damaged safe in her office, Ismailova explained that their Bishkek offices have also been targeted. Bir Duino is one of only a handful of NGOs that publicly support the LGBT community. Ismailova acknowledged that their opposition to the 'gay propaganda' bill may be another reason that they are currently being targeted. However, she said that Bir Duino believe that LGBT rights are human rights and warned that the government will not stop at the persecution of LGBT people.